Is it another One to watch? The Desire 500 didn't make much of a mark, will the Desire 310 fare better? While much of the world is feverish with expectation about the flagship HTC Two, the Taiwanese company clearly hasn't forgotten about the lower end of the market, as it's cooking up a budget blower with quad-core credentials. The phone, called the Desire 310, was spotted on HTC's official website, so it's unlikely to be the figment of someone's imagination. While the listing was quickly pulled, Japanese site Blog of Mobile was able to get some information on it before it disappeared. The headline feature is its quad-core processor, but don't expect HTC Two or even HTC One levels of performance from it as it's clocked at 1.3 GHz and uses a relatively cheap MediaTek chipset rather than the Snapdragon chipsets that HTC usually uses. The HTC Desire 310 also only has 512MB of RAM, so we're actually looking at a fairly low end handset. Rounding out the main specs it has a 4.5 inch 480 x 854 resolution display and just 4GB of built in storage, though there is a microSD card slot. It also has a 5 megapixel camera with no flash, a VGA front-facing camera, dual-SIM support, a 2000 mAh battery, it comes in black and white and it runs Android 4.2.2. 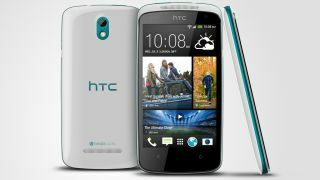 The inclusion of dual-SIM support makes it clear that the HTC Desire 310 is aimed squarely at emerging markets. That doesn't mean it won't hit these shores too, but right now we have no word on if or when that will happen. HTC looks to be making a real play for the mid and entry level market as this is the second budget HTC handset that we've heard about in the last few days, with a slightly higher-spec octa-core phone popping up at the beginning of the week, packing 1.5GB of RAM, a 5 inch 720p screen and an 8 megapixel camera. Chances are we'll see all of these at MWC 2014 - so stay tuned to check out whether they're worth considering or just a half-hearted attempt from HTC at capturing the budget market. Can't wait for the Desire 310? Check out the budget HTC Desire 500.